It’s safe to say that the reputation of Las Vegas can be as wild as you perceive it to be. But that doesn’t mean you can do anything here and not get in trouble. That is why Las Vegas bail bonds services are quite popular in the Sin City. Drugs like cocaine or heroin are simply not a good idea, and that’s especially true in casinos. Even Paris Hilton found that out the hard way when she got arrested for possession. It’s a category E felony in the state of Nevada, and it can get you a year to 4 years of jail time. Even marijuana is not exempted. While the state allows adults to smoke weed for fun, you can’t do so in a casino as that’s against the rules. In fact, the only safe place to smoke marijuana is in a private home. In a casino, it’s a no-no. While there are legal bordellos outside of Las Vegas, in the city itself it’s still a crime to pay for sexual services. Casino employees are always on the lookout for prostitutes, and you can be arrested along them if you pay for their services. While you may be approached by these ladies, you can always just politely say no. It’s always the safest option in every sense of the word. You don’t risk getting arrested or getting a disease, plus you keep your money. Some prostitutes may even steal your wallet when you fall asleep. This used to be a very old rule that was enforced because of the law forbidding interstate bets. Sports books officials were concerned that someone can make bets at the direction of someone else out of state. Since smartphones are so ubiquitous today, this rule isn’t as strictly enforced anymore. But it’s still possible that a sports book can still forbid this practice. If that’s the case, then you should just leave and go to another sports book in Vegas. Many casino clients want to maintain their privacy, and that’s why plenty of casinos ban all types of photographic activities within their area. People have sued casinos for letting other customers take pictures of them, and so casinos have learned to help protect people’s privacy. Taking videos and photos may also help some cheaters, and that’s another reason why casinos don’t like cameras. Card counters can take photos of played hands to keep count of the cards that have already been dealt. But what if you wish to take a picture of yourself having a great time in a Vegas casino? If that’s the case, try to ask one of the casino employees for some help. Perhaps they can take a picture for you. Casino officials have the right to ask anyone inside their place to show their IDs. If you can’t produce a valid ID, the casino can keep your winnings and then ask you to leave their premises. This makes it extremely important that you always have a valid ID with you. Having an ID lets you do adult things in a casino, like gamble and drink. You just want to make sure that you can prove you’re an adult. Just because you think you look old enough isn’t really going to cut it. 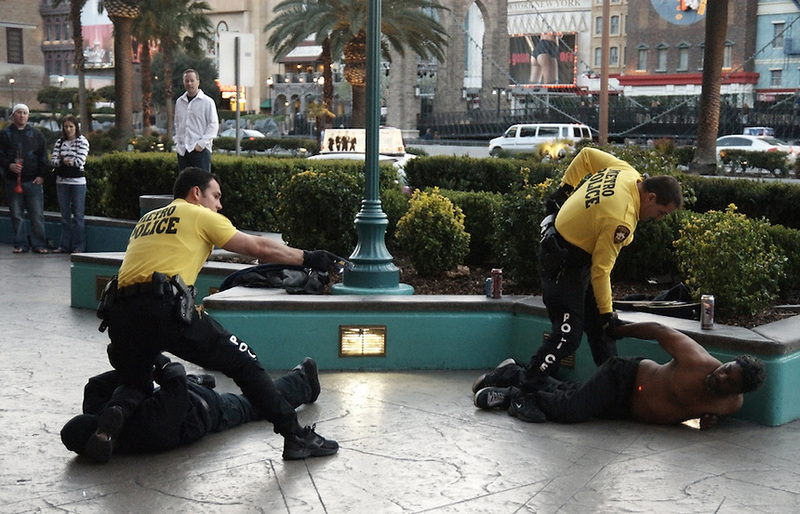 Technically speaking, public intoxication is actually not a crime in Las Vegas. Some casinos may even like it a lot if you’ve been drinking when you gamble, because you can’t think as clearly when you’re drunk. In some places, casinos may even offer free drinks to winners to tilt the odds even more towards the house. But if you can’t handle your alcohol, you really should refrain from imbibing. Being drunk may not be a crime, but what you do when you’re drunk can be. The casino can ask you to leave if you behave inappropriately while drunk, and if you foolishly refuse to leave you can be charged for trespassing. Other possible charges can include disorderly conduct and disturbing the peace. Yes, clearly, this can get you arrested. Even if the casino simply just suspects you of cheating, you can be asked to leave the premises and promise never to come back. If you do come back, you’ll be held for trespassing. This makes it imperative for you to understand what constitutes cheating in the eyes of casino officials. So while card counting is not technically a crime if you don’t use an external device to keep track of the cards used in blackjack, most casinos still object to the practice. So if you insist on using this technique, find a casino that actually tolerates it. If you’re not sure about what’s cheating and what’s not, just stick to the roulette tables or the slot machines. You can check out patterns of results all you want. It won’t really help you, but at least it’s legal. It’s best if you take some time and effort to study up on what you can do inside a casino before you actually get here. Ignorance of the law doesn’t protect you. But if you do get arrested, don’t panic. Contact 24/7 Las Vegas Bail Bonds at 702-899-2775 and we can help you get out of jail as quickly as possible. With our Las Vegas bail bonds service, you can deal with your legal situation more effectively.